with shower and finally a comfortable terrace where you can relax at the end of a day around the city or where to start with a rich breakfast! Your holidays in our apartment will be relaxing and unforgettable. Appartement conforme aux descriptif, et au calme. Le bus 916 vous emmène directement a la plazzia venezia. Petite info, le sèche linge est juste un étendoir. Very nice and clean appartement. Very complete aswell! Very nice and clean appartement. Walking distance to Vatican, approx 20-30 minutes. Shops and cafés around the corner. Das Appartement war sehr sauber und groß genug für 4 Personen. Mit dem Bus oder auch zu Fuß ist man schnell im Zentrum von Rom. Service der Argentur war stets zuverlässig und freundlich. Ich würde dieses Appartement und auch den Anbieter weiterempfehlen. Es waren rund um schöne Tage in Rom. 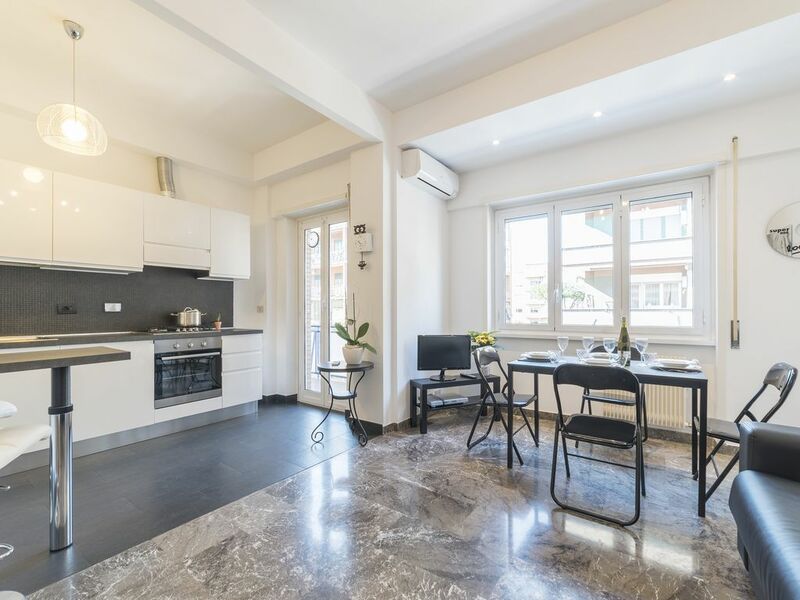 The apartment is located in the lively Aurelio neighbourhood, the western area of the city, close to the majestic Vatican walls and the ancient Aurelian Walls. aren’t yet touristic like simple and tasty “pizza al taglio” and trattorias. Basilica, the Sistine Chapel and the Vatican Museums, the famous Piazza Navona and the charming Campo dei Fiori are at a short distance as well as for the archaeological area of the Colosseum and the Roman Forum. its 180 hectares it is one of the largest roman parks and it houses one of the best-preserved Villas of Rome. In this wonderful natural paradise sports lovers can dedicate to their training with long walks and outdoor sports, families can bring their children to have fun, play with them, enjoying nice pick-nicks and use the entertainment service of the park during the summer months.